BBC World Service - World Have Your Say, Is there an honourable way to deal with terminal illness? Is there an honourable way to deal with terminal illness? 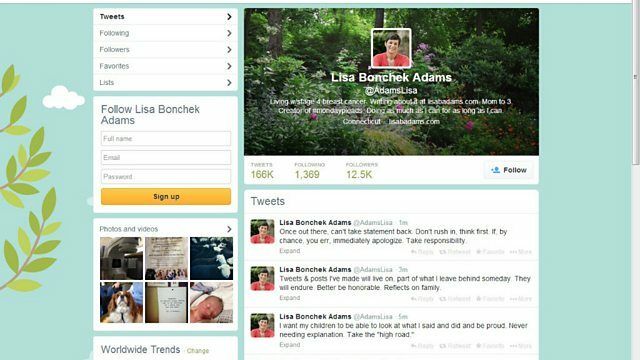 Lisa Adams tweets regular detailed updates of her daily life with breast cancer. It has generated a lively debate in the media and online. We get reactios to this story. We discuss the lively debate currently in the media and online about an American woman tweeting regular detailed updates of her daily life with breast cancer. Journalist Bill Keller wrote in the New York Times that Lisa Adams' twitter feed gave "false hope" and portrays those who chose palliative care instead of fighting cancer as "failures". His wife Emma Gilbey Keller also wrote "what are the ethics of tweeting a terminal illness? Is this educational or too much?" In spite of this Lisa Adams has vowed to continue sharing her story. She tweeted that it is "better (to) be honorable (as it) reflects on (my) family". What is your reaction to this story? Is the Francois Hollande Scandal an Important Story? Is the Vatican UN Hearing a Big Step for the Catholic Church?